This site is dedicated to all things Volkswagen Transporter. Split Screens, Bay Windows, Campmobiles, Westys, Trucks, Panelvans, and Kombis... I love them all. SPOKANE, Wash. - After 36 years it is finally home. Michelle Squires' 1964 VW Bus was trailered back to Spokane this weekend from California where it was found last year. The van was stolen from an upholstery shop in the Browne's Addition area of the city in 1974. Squires thought it would never be seen again, then a customs agent discovered the stolen van at the Port of Los Angeles. I've been keeping up with this story - but certainly not this blog! This was one story I had to post. Merry Christmas! 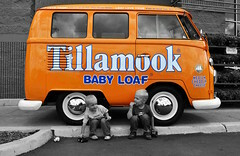 Check out Tillamook's latest Cheese campaign - the Loaf Love Tour. Complete with some vintage VW Buses. Follow their progress (with more cool pics like the one below) on their Flickr stream or Twitter @TillamookCheese. I love's me some Tillamook cheese, and I loves me some VW Buses... looks like a nice mashup. Of course, the shortening of vintage buses hurts a little - nothing a nice cheese plate won't fix. Follow me @ilovevwbuses on Twitter. You could win a 1977 VW Bus! Cheerwine - Win The Chillest Ride In The Universe. Go enter... you might get spammed about wine, but you could also win a VW bus... and that's pretty cool. 1963 Blue & White VW Bus stolen in LA - Lets find it! "The bus is in great condition, in the slow process of restoring it, just had a newly built engine. God, this car is so important to him! ... A neighbor said they saw the bus around 1 am outside of Chango, with the blinkers on. It was in front of a silver sedan apparently. He assumed we were in the car. This was the last anyone has seen of the car." Dude... not cool. Where is the cat going to sit? We need to find this ride and fast. Check out the pictures above and help this guy get his bus back. I'm not sure the thieves realize the karma involved in taking someone's VW bus. They'll find out soon and it won't be pretty. Coming up on May 2, 2010 in Ennis, Texas at the Texas Motorplex will be the 25th Annual Bug-In. Camping starts on May 1st at 6:00PM and the show, swap meet, and races are on the 2nd. Check out the slideshow below for pictures of VW Buses from last year's (2009) event... looking forward to this year! Driving along Highway 75 - The Central Expressway - in Dallas on Saturday, a VW Bus (not sure of year or style) passed us like we were standing still. So many things wrong with that it's not funny. I feel bad. Happy Birthday Bus... 60 years old on March 8, 2010. And somehow, you seem so much older than that. Make sure you link through to the Time Magazine article, lots of great vintage VW Bus pics. Ben Lobaugh found this pic (below) on The Samba and posted it to his blog. It shows a vintage VW Bus Walk-through Panel Van "jacked up" on blocks in what appears to be a very unstable configuration. Yes, I know this is now a third-generation post (or more, depending upon where The Samba thread started) but, well... I thought it was cool and decided to post it. Its also a nice public service announcement. Sonoma County area, Santa Rosa, Windsor, Rohnert Park, Guerneville, Sebastopol, Petaluma, etc...I'll put the miles on for the right deal!! !